For many bands, five years seems like an eternity. Within a five-year timespan, a band can theoretically formulate material, create a demo, sign to an indie label, release an album, tour the nation, sign to a major label, release another album, wait for it to flop and have their entire career unravel right before their very own eyes. Hey, it’s even been done in four before. But for Sean O’Donnell of San Diego based Reeve Oliver, it took five years to barely get his project off the ground and create a properly-released album. And it’s not because Sean, a prolific songwriter who had established himself through previous efforts, was resting on his laurels. It is, however, due to his careful and considerate planning, meticulous ear for crafting the superb pop rock hit and skills as an engineer and producer, that his five years has been time considerably well spent. And if slow and steady wins the race, you might as well finger Sean and his band Reeve Oliver as the ultimate victors. Reeve Oliver began as a pipedream solo project for Sean in 1999, who used the moniker as an outlet for a batch of songs he had assembled which didn’t necessarily fit the traditional mold cast for the other projects he’d been involved in. After performing on the local scene with a cast of musician friends for a few years, Sean, who moonlights at the San Diego amusement park Sea World as a pre-show entertainer (The Dolphin Show), singing to thousands of park guests everyday, made Reeve Oliver his main priority in 2002. It was then he joined forces with novice drummer and fellow Sea World entertainer Brad (The Sea Lion and Otter Show) and later enlisted the talents of veteran punk and Fluf frontman O. on bass. 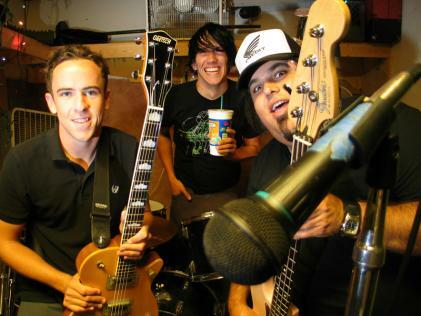 Upon the release of Reevolution, Reeve Oliver hit the stages of the Warped Tour in 2003 to largely receptive audiences. That tour was followed by a stint with Yellowcard, which found the act gaining support well outside their region, largely due to the word of mouth spread by their more popular peers. Using his relationship with The Militia Group, which stems several years before the label existed, Sean signed on with the label this year and immediately got to work on the band’s debut full-length. “I produced it completely myself, which I do not recommend,” Sean says. “It was just a lot of work. I had to make a lot of crucial decisions which really ended up stressing me out.” But the stress has paid off into a picture-perfect power-pop disc, accurately reflecting Sean’s compositions, which are inspired by artists like Dinosaur Jr. and The Lemonheads. Sonically finessed via the mixing efforts of San Diego native and indie rock studio veteran Mark Trombino (Rocket From The Crypt, Blink-182, Jimmy Eat World), Reeve Oliver’s debut was ably placed into good hands for a final touch.